﻿ Care Bacter 0220.005 - a miracle solution for your aquarium? Care Bacter 0220.005 – A Miracle Solution for Your Aquarium? 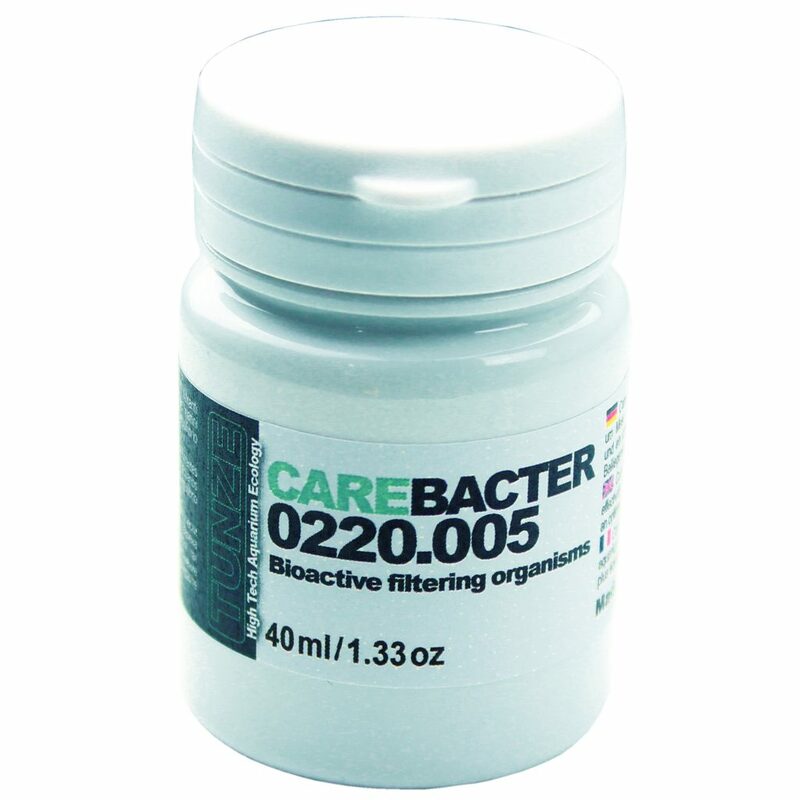 Care Bacter 0220.005 is a new bacterial supplement from TUNZE designed to lower nitrates and phosphates while also reducing the risks of Vibrio. A miracle solution for your aquarium? For our own part, we are entirely convinced! Our opinion is the result of long-term testing in many different aquariums, and indeed, we are confident about the credible and incredible mode of action of Care Bacter. Looking back, we ask ourselves why we should still use biopellet reactors, zeolite reactors, or denitrators. Care Bacter is an exceptional blend of bioactive filtering organisms that was specially formulated to effectively clean both saltwater and freshwater aquariums, and to ensure an optimal biological balance. Care Bacter is an ideal supplement for technical installations such as aquarium filters or powerful skimmers. Especially in marine aquariums and with an efficient flow within the biotope, its effectiveness will rapidly become clearly evident. The same applies to older aquariums, which show a lack of bacterial flora and/or an accumulation of organic matter. Here, Care Bacter improves the biological function and significantly reduces algae and sediments. Care Bacter consists of bacteria strains, which are not genetically altered (EC directive 200054), are non-pathogenic, and work together in combination extremely well and synergistically during the water purification process. One strain of bacteria acts as a primary driver of the nitrogen cycle, thus ensuring the complete removal of dead organic components in the aquarium (protein > ammonium/ammonia > nitrite > nitrate) and thereby additionally binds the resulting nitrate. This bacteria also removes phosphate by absorbing it. This yields a highly effective water purification system. The absence of phosphate and nitrate therefore prevents the propagation of algae. The second strain of bacteria is used against pathogenic bacteria of the genus Vibrio, which are extremely harmful to an aquarium biotope. Through this, Care Bacter protects fish, shellfish, corals, etc. against pathogen bacteria, and facilitates their acclimatization to the aquarium. For stony corals such as L.P.S. and S.P.S. types, Care Bacter significantly reduces the risk of a rapidly progressive tissue necrosis R.T.N. Finally, Care Bacter significantly enhances the biofilm in the aquarium, and thus supports certain types of coral or substrate animals. Care Bacter also demonstrates an impressive side effect: The aquarium glass panes remain clean even longer! Additionally, Care Bacter can also be used in garden ponds, and is effective there at temperatures above 15°C. Various green and filamentous algae will be greatly reduced, algae growth on aquarium panes will be retarded. The introduced bacteria are in competition with the algae mentioned. Nitrate and phosphate compounds decrease. The bacteria take up nitrate and phosphate compounds as food and are then consumed by corals, or respectively separated by a skimmer or filter at the end of their lives. Corals and fish gain vitality. The bacteria and the other contents supplement the defenses and reduce the risk of diseases, especially of Vibrio infections. The aquarium appears much cleaner and organic detritus/duff is significantly reduced. The bacteria can use the detritus/duff as food.